These books may not be on the best-selling list, but I love them anyway! Hiya there, how you doing? It’s Top Ten Tuesday again, and the topic is books we’ve enjoyed that have less than 2,000 ratings on Goodreads. Now, I did something somewhat similar last week with my Top Ten Tuesday, talking about two authors who don’t get enough attention considering how good their books are, so those books deserve a mention as well, but since we’re talking about single books this time, I can definitely find some! (The Silver Bowl by Diane Stanley and Mama Cried by Talia Haven are the books mentioned last week.) These will be in order from least amount of ratings to the most! 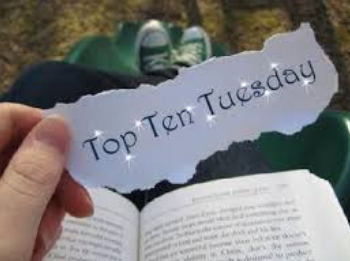 Top Ten Tuesday is a weekly bookish meme hosted by The Broke and the Bookish. The Angel Tree by Daphne Benedis-Grab – I borrowed this book from a friend and absolutely adored it! It is such a nice idea. The town has a ginormous tree in the middle, and people fill out little pieces of paper with their Christmas wishes and put them on the tree, and then other people who have enough to help others take it and make sure it comes true. Some incredibly amazing wishes are granted. Definitely a story worth reading! The Time of the Fireflies by Kimberly Griffiths Little- I actually own this book, and I totally loved it. The girl receives phone calls… On a disconnected phone. There is a swamp. There are fireflies (obviously). *MINOR SPOILER* There is time traveling. *SPOILER OVER* There is a CREEPY DOLL. What’s not to like? Revenge and the Wild by Michelle Modesto- I also think I’ve mentioned this one once or twice. Guys. CANNIBALS. And somehow she pulls it off!!! I totally loved this story and was shocked to see how few ratings it had, especially considering the fact that it seemed to be a subject of discussion for quite a bit on Goodreads. Pregnant Pause by Han Nolan- I reviewed this one a while ago, and I just absolutely adored it! The writing style is so unique and really pulls you in to the story. A World Away by Nancy Grossman- I also reviewed this! I really enjoyed it because it shows a lot of the struggles, as well as enjoyments, of the Amish way of living, which I knew next to nothing about before reading this book. I was captivated because Eliza not only has to choose between family and friends, she has to choose between completely opposite lifestyles. Dissonance by Erica O’Rourke- I believe I also reviewed this (wow, I must do that a lot of these or something), but I really liked the world building! All the dimension hopping was super unique and kept me interested. Slash confused. Did you guys do this week’s Top Ten Tuesday? Link it down below! Have you read any books on this list or have any to recommend to me for this challenge? Talk to me in the comments! ‹ PreviousTHIS IS WHAT HAPPENS WHEN YOU ARE FORGETFUL. Thanks! 😉 I know right??? Cannibals are completely under-represented and it’s so interesting/gross that I had to read it hehe. Awesome! Hahaha yes it was totally cool and I own it! Hahaha awesome! Yes; I totally meant to go through and look at other peoples’ posts but unfortunately I’m really focusing on my current Bibliothon…. Awe, thanks! It totally was, and very unexpected. 🙂 I hope you enjoy it! Hahaha, let me know how it goes!